One of Bernie's many bulls. This one is perched on a table in his office, where he conducted many of his dirty deeds. 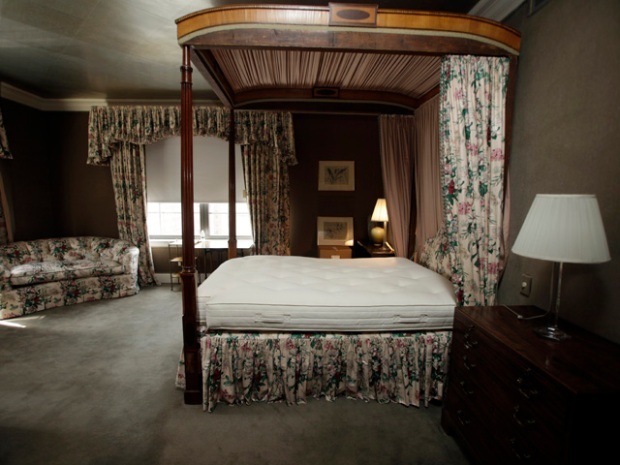 If you take a tour of Bernie Madoff's penthouse or check out the furnishings in his Palm Beach digs, his beach home or even his yacht, you'll walk away with one clear, albeit disturbing, thought in your mind: The man apparently has a bull fetish. 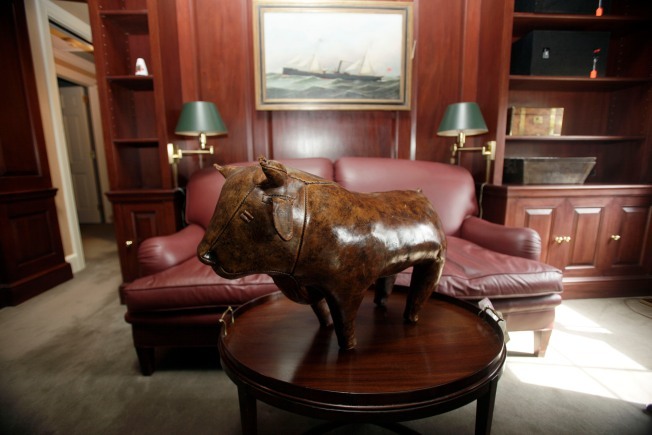 Madoff's got bull statues in his Upper East Side luxury digs. He's got bull paintings in his Palm Beach house. He's got a yacht named "Bull," a smaller boat named "Little Bull" and has T-shirts decorated with bull logos and motifs. Get this: The disgraced financier even has napkins and glassware engraved with "Bull" -- you know, the male version of a cow. We have no idea why, but we can postulate some thoughts. Perhaps it's because Madoff's whole business was bull -- a sham -- a $65 billion Ponzi scheme built on the shoulders of the individuals he ruthlessly defrauded. Or it could be because he was bullish on the market, meaning confident that prices would rise -- even though he never really seemed to have actually invested much money in any real stocks. Or maybe, just maybe, he was compensating for something. After all, Sheryl Weinstein, the woman with whom he had an affair and later counted among his Ponzi victims, disclosed in a tell-all book that Madoff left a bit, ahem, to be desired in bed. Whatever the case, Madoff was mad about bulls. A U.S. marshal who helped seize Madoff's luxury home, worth more than $9 million, in Palm Beach, told Reuters the place was loaded with symbols, objects and images depicting bulls. "There were bulls everywhere," Deputy U.S. Marshal Barry Golden, who spent about three hours in the house on Wednesday, told the wire service. "That stood out in my mind. It's just that there were a lot of statues and pictures and things, bookends and so forth, of bulls." The art only shows bulls in specific poses. There are no pictures of bullfighting in any of Madoff's properties or on his boats. There are only the lone bulls -- standing stoic, singular and, more often than not, well endowed, on their pedestals or in paintings and photographs affixed to the walls. Golden wouldn't deign to say whether there was a bull connection to the Ponzi scheme Madoff masterminded, reports Reuters. He said it wasn't his place to "comment on what it all means." Well, if anyone has a clue, we'd be interested to know. Check out the photos -- it's kind of bizarre. Really.